Cam's Cinematic Episodes: SPIDEY Watch: Unwebbing The New Trailer. SPIDEY Watch: Unwebbing The New Trailer. Holy doodle! I never expected to have to do so many Spider-Man 3 posts over such a short amount of time! That said, today was something I really couldn't ignore. At 10pm EST tonight, the new trailer for the third chapter in the amazing/ spectacular/ sensational film series hit the web and American television in a blitzkrieg of promotion. You were going to see this trailer NO MATTER WHAT, DAMMIT! And if you didn't, well, I'm gonna post a link to it and praise it (with a few exceptions) here tonight. I've now watched it a half dozen times and made a few mental notes. Basically just enough material to waste precious moments of your time with. Yee-haw! Wow, that was a really cool trailer! 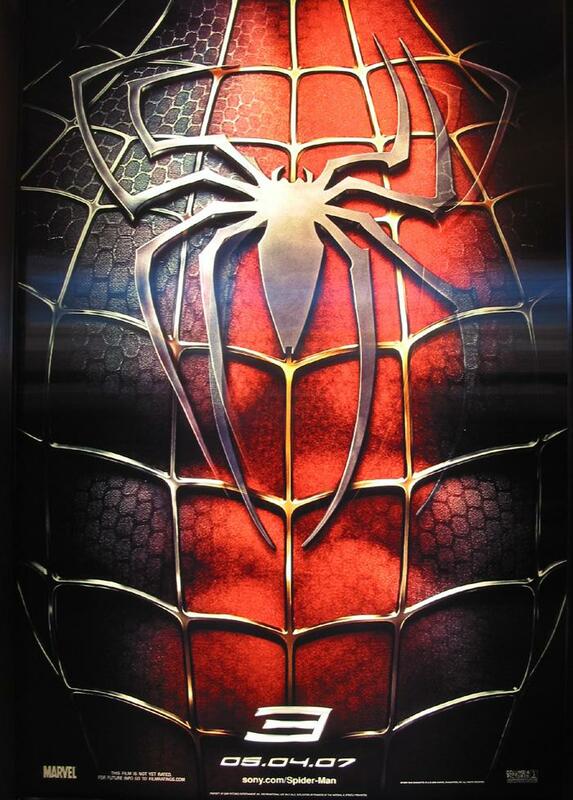 It wasn't as spectacular as the Spider-Man 2 trailer, or as powerful as the Spider-Man 3 teaser, but still, it was damn cool! For those of you who somehow avoided it (Sony will probably show up at your door and forcibly make you view it! ), here's a link to it: http://www.ifilm.com/video/2783985?loomia_si=1. Now, much speculation surrounded the release of this thing. Venom-fever was hitting a disturbingly high rate and people were frothing at the mouths for his appearance in this thing. Well, let the speculation continue because he doesn't show up here. 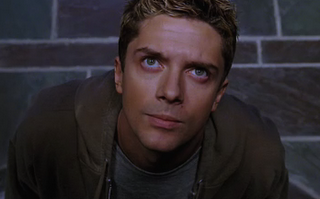 Heck, his alter ego Eddie Brock (Topher Grace - pictured here from the teaser trailer) only shows up in three super-fast snippets. So, while I'm disappointed, I'm now even more excited for the 2nd trailer that will be airing before Ghost Rider starting on Feb. 9th. Come on people, there's still 5 months till this thing gets released; you really expected them to give EVERYTHING away! I say good on them! Let the suspense build! I'm tired of everything being given away in trailers far ahead of the films release. I can wait to see Venom in action (Though I'll still continue with my obsessive theorizing and posting production photos). We learn in the trailer that it was actually Sandman (aka Flint Marko) who was the REAL culprit behind Peter Parker's Uncle Ben's death. Now, this is nothing short of sacrilege in the comics' community (Go search up a topic on it at a comic book web board. It's ugly! ), but I'm going to sidestep that argument. I don't like it because it fee ls too convoluted. Like, oh, by the way, another super-powered villain is personally connected to Spidey! I mean, can't at least one of these films feature a villain who has no role in Peter Parker's life? Apparently not. This is an addition that just doesn't work for me... It seems like they're trying too hard to give a less fleshed out character a reason for existing. I still am optimistic, however, that the film will deal with the change in a proper manner. Sam Raimi thus far has a flawless track-record and I don't want to doubt him too much. We also get a little more of Harry Osborn and his anger at Peter for his father, Norman Osborn aka Green Goblin's death. There's not a lot new here, but I'm curious to see how James Franco handles the chore. His character is one of the most tragic in the comic-book series and I hope it translates to the film well. I'll happily forgive the Snowboard Boy suit if the emotion rings true. On the happier side, the trailer hints that there may be an engagement for Peter and Mary Jane this time around. Since the two characters have been married for almost 20 years in the comics, this is hardly an unexpected event. From what we see here, Kirsten Dunst seems to have really stepped it up and is showing Mary Jane's mature side. Many felt she was sub-par in Spider-Man 2, but the trailer really gives her character more gravity and authority. Hopefully, she'll be closer to the strong, independent character from the comics. It'll be interesting to see how the love triangle between her, Peter, and Gwen Stacy (Bryce Dallas Howard - only glimpsed once in the trailer) is presented. I hope it's not too soapy. So, Sam Raimi, pat yourself on the back! This trailer left me satisfied and yet still wanting more. My mind is reeling at the possibilities and I can't wait to see what's going to happen. If this is the final Spidey (well, from this creative team), it looks like you may just go out on top (like how the producers of The X-Men series wish they did!). This True Believer is giddy with anticipation for May 4th. Good show, old bean! Okay, and now for something completely different! A letter! Kim writes: The Big Lebowski [is] a movie that [my husband] thought was really funny, [yet] I couldn't sit through. Any thoughts on that one?" Hmmm.... This isn't the first time I've heard divided opinions on this one. My friend Gabe swears by the movie. He's seen it umpteen times, and can accurately quote the majority of it. My friend, Mark, on the other hand, thought it was boring. Heck, the critics couldn't even make up their mind on this one. Now, me? Well I love it. But I'll explain myself. The Big Lebowski is a masterpiece of randomness. The whole movie essentially plays out to the same pace as the lead character's mental state. The plot is all over the place, bizarre characters pop in and out, and there is no real closure at the end of the film. Heck, even the narrator seems to be narrating a whole other movie. Now, the film's creative team, the Coen Brothers, are definitely an acquired taste... I personally thought Fargo (1995) was brilliant, and quite enjoyed O Brother, Where Art Thou? (2000). Now, with that said, I thought Intolerable Cruelty (2003) was quirky to the point of being tiresome, and 1987's Raising Arizona was almost unwatchable. There isn't really a middle ground with these guys and I'd say your husband and you just happened to fall on opposite sides. There is still hope though. I'd say give Lebowski another chance. Settle down and don't anxiously try to follow it scene for scene. Rather, sit back and just witness the film unfold. It's a film that rewards a relaxed state of mind. Don't try to connect-the-dots or anticipate the mystery plot, as it's simply a clothes-line for the characters to hang from. Enjoy the film for its moments, rather than as a whole picture. It's a comedy of the absurd. The jokes are sly and weird, and aimed at a certain sensibility. I often fondly think of the bizarre Busby Berkeley-style dance numbers, John Goodman's intense performance, and that great scene where the narrator meets The Dude and the two have an aimless conversation that goes nowhere. Because that's what the film is meant to be, aimless. 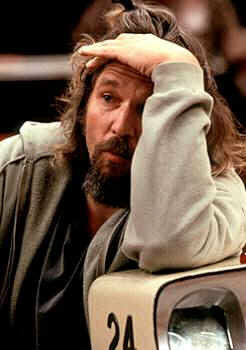 Plus, take greater notice of Jeff Bridges. His performance is brilliant, as he completely disappears into the character. It's a great comic performance. Besides, I dare you not to laugh at the final scene where The Dude and Walter toss Donny's ashes out to sea. I don't know if this is any help. Not all people like the same films. I personally thought Scarface was garbage! I also strongly disliked Jerry Maguire! So, don't feel you're missing out if this one just isn't your style. There will be undoubtedly a film in the future that you will love and he will find pointless. It's the nature of the beast! Okay folks that does it for me! If you have questions, feel free to email me at camspcepisodes@hotmail.com! I may even give you some space on the blog like today's letter! A great honor, if I can say so myself! Wow! Check out the junk mail alert on the swingingest blog ever.